Betal narrated another story while Vikram was carrying him. Anand was a minister in the king's court. He loved a girl called Anju. But when he came to know that Anju's marriage had already been arranged with someone else, he was disappointed and decided never to marry. When Anju came to know about Anand's pledge, she wrote him a l etter saying that she would come to meet him after her wedding. On her wedding night, she told her husband about Anand and went to his house. On the way, a robber tried to take her jewels away. She told him that she would return after a while and he could take her jewellery then. The robber let her go. When Anand saw Anju he thought that if he accepted another man's wife, the king would punish him. So he asked her to return to her husband. Anju decided to go back to her husband. on the way, She met the robber and told him her story. She even offered her jewels. The robber was good at heart. 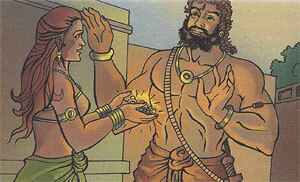 he did not accept the jewels and escorted Anju to her house. When Anju went back to her husband , he refused to accept her. With nowhere to go, Anju killed herself. Betal asked Vikram, "Who was the only noble man among the three?" Vikram replied, "The robber was the only noble man because he helped a girl in trouble at a time when he could have easily robbed her." Betal heard this and flew away since Vikram had spoken aloud.